This book provides students with a balanced perspective on business in a global environment, exploring implications for multinational companies in developed and emerging markets. This is the first text of its kind to emphasize strategic decision making as the cornerstone of its approach while focusing on emerging markets. Traditional topics, like foreign exchange markets and global competition, are contrasted with emerging operations, like Chinese market intervention and Islamic finance, to provide students with an understanding of successful business strategy. Readers learn to develop and implement these strategies across cultures, and across economic, legal, and religious institutions, in order to cope with competitive players in the global landscape. Application-based chapters open with reading goals and conclude with case studies and discussion questions to encourage a practical understanding of strategy. 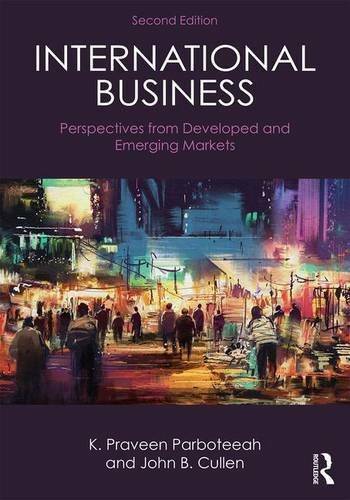 With in-depth analyses and recommended strategies, this edition provides students of international business with the skills they need for success on the global stage. A companion website features an instructor’s manual, test bank, PowerPoint slides, and useful links for instructors as well as practice quizzes, flashcards, and web resources for students.